Posted by Bravado Cooking for Men in Classic American Dishes, Classic Meat Dishes, Recipes. 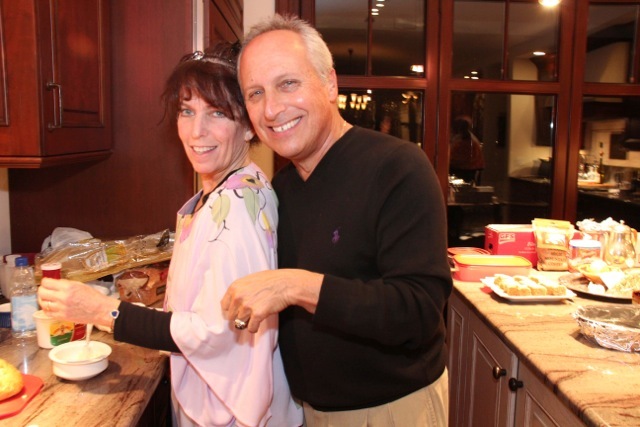 The Annual New Year’s Dinner Award goes to Howard Storck – charter member of the Bravado Cooking Society – and Carla Gorsky. (They, btw, were the ones that triggered the special post about making a one-handed pie crust – a must see with the video clip from “The Postman Always Rings Twice”.) They were helped by sous-chef Larry Hake and their dog, Charlie. 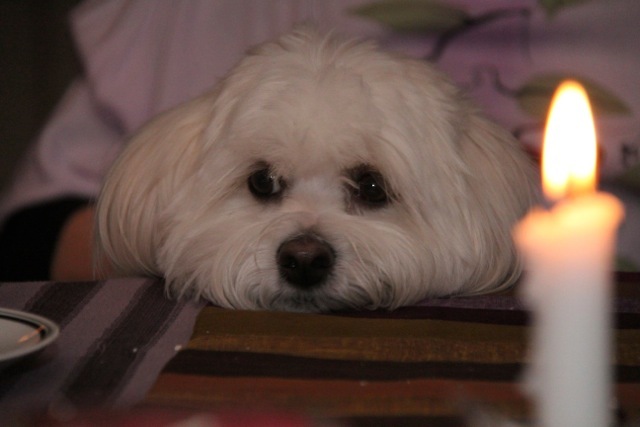 Boy, Did I Like The Prime Rib – Hope I Can Make It Until Midnight! 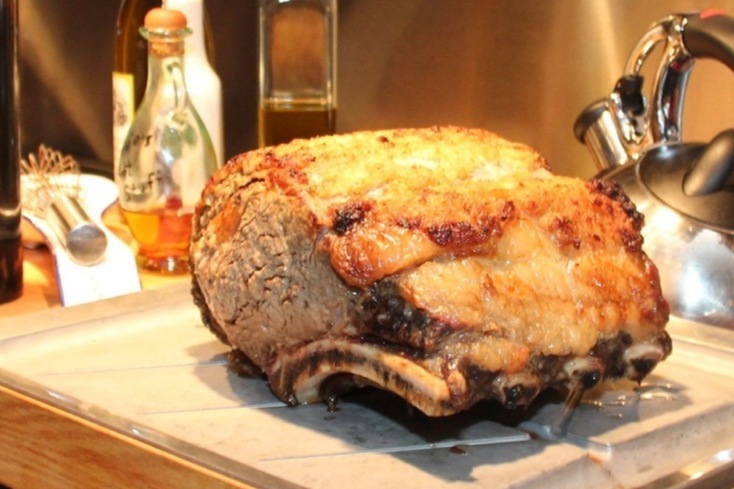 How about a horseradish encrusted prime rib…with a red wine reduction sauce…homemade creme fraiche….roasted potatoes and onions with sage…and roasted vegetables? The rib roast (8 lbs) was encrusted with a horseradish mixture containing 5 mashed cloves of garlic, 1/4 C prepared horseradish, fresh rosemary chopped, salt, pepper, EVOO. This was rubbed generously all over the roast…both sides and ends as well. Then the roast was first roasted in a 450 oven for 15 minutes…then roasted in a 350 degree oven for about 2 hours, until internal temp reached 125. The crème fraiche was homemade because I could not find it in our local Piggly Wiggly…they had no clue what I was asking for. And so I researched the recipe…bought a container of sour cream and added a little buttermilk…being careful not to add too much as it will get too runny. I then added a very generous amount of horseradish…tasting all along the way to be sure it had sufficient kick. Let this cool in the fridge for a couple of hours…tasted again and added just a little more horseradish. Sautee one chopped large yellow onion with some fresh garlic and a chopped shallot in butter. When nicely browned and some particles are sticking to the pan, deglaze with a cup of red wine…I used a Merlot…and let it cook for a while to reduce by half. Then strain the mixture…and enjoy the sauce over the prime rib with the crème fraiche horseradish sauce on the side. Oven roasted potato wedges accompanied the roast…as did green beans sauteed with garlic. Sourdough garlic bread on the side…of course.